With the bus stop located at the front of the property Domain Stadium (4km), WA Athletics Stadium (2.4km), Matthews State Netball Centre (2km), Wembley Golf Course (1.6km), Quarry Amphitheatre (2.1km), Bold Park Aquatic Centre (1km) and Challenge Stadium (walking distance), are all within easy reach. Perth Arena & NIB stadium, The WACA and the New Burswood stadium all within easy reach, also via public transport. Be close to family, relatives and friends in hospital or in need of medical treatment with St John of God Subiaco (4km), Sir Charles Gardner (6.6km), Princess Margaret (5.8km), Hollywood Private (6.2km) and QE II (6.2kms) Hospitals, plus numerous medical facilities all close-by. Forum (900m), Claremont Quarter (7km) or Westfield Innaloo (6km) - all with free undercover parking. Outstanding dining opportunities in Subiaco, Wembley, Claremont and City Beach. I was born and bred in a farming community in South Africa where I attended school and university. Fortunate enough to be posted around the world I also spend 6 years in the Netherlands before being transferred to Western Australia 12 years ago. I fell in love with the land and the people and decide this is where I want to grow old. I have two lovely teenage children. I am not that keen on cities but I found Perth to be the most livable city in the world. It has some of the best weather in the world. A few years ago I got the opportunity to buy a business in remote Western Australia and needed somewhere to stay in Perth when I visited. 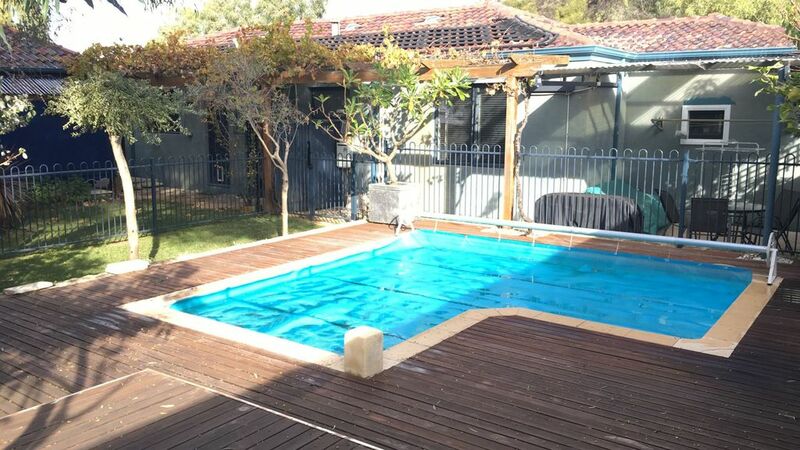 I created two comfortable units in the original house as I needed somewhere to stay when visiting Perth regularly and I loved the Floreat area. It is so central - near the beach, a lovely park across the road. With 6 or 7 different ways to get into the city , there is no need to get stuck on the freeway. I used to cycle to work in the City. Perth has one of the best climates to cycle. Floreat is a lovely tranquil suburb with magnificent trees, parks and birdlife. The dining space is in the kitchen area which is of reasonable size. Central location with easy access to many shops, parks and other facilities. Unlike the larger neighbour, this unit has no lounge space but the spare room is ample size as a makeshift lounge. Had everything we needed for a comfortable short term stay. I hope your stay was comfortable. Hopefully the other unit will be available next time. Really nice place to stay. Very clean and modern inside and quite comfortable. Very central. We enjoyed our stay over Christmas and New Year. Great having Perry Lakes across the road and great walks for us and our dog. The place was really nice, neat and clean and very comfortable. Caretakers very helpful and made us feel welcome. I'd certainly recommend this for anyone wanting to stay in Perth with their pet. I am glad the unit was to your satisfaction. Thanks for being so easy to host!. I hope we will see you back again. We had a great stay at Sias' property with our small pug. Pool was a perfect little relaxing retreat, and cottage was well equipped. Being directly across from Bold park and the skate park kept the visit interesting and exciting with beautiful outdoor activities available. Bus stop right at the front door takes you to the train station or city centre. Floreat Forum shopping centre is only minutes walk away, meaning everything is right at your fingertips. Only downside was a lack of living area/common area for relaxing together in. There is a tv only in the second bedroom (kids room). Some yard maintenance (cleaning pool, air blowing deck area) was done whilst we were there which seemed a tad unnecessary. All in all a very pleasant stay, would recommend and stay again. I am so glad I booked to stay at Sias property. Not only was it just as described, with beautiful local walks, easy to access shops, fabulous local beaches; clean, homely but most of all we got to meet Sias and his family who are genuinely lovely, lovely people. Perry lakes is conveniently located to pretty much everything, is on a great central commute route to either CBD, NOR or SOR. There is plenty to entertain the children, animals or seniors, whether it's hustle and bustle, Sea side strolls or quite bush walks with the convenience to dump your bags and sleep very comfortably home away from home. Very convient, clean and pleasant. The unit was ideal for a short stop over in the city which is what we needed. The care takers were friendly and available as we required.